Here’s a thing you can use to practise in all keys. Take all 12 keys and arrange them into four groups. The keys are arranged like this so that each time you change key about half the notes change. And that’s different to the usual way of playing things through all keys where you’ll change key by going through the cycle of 4ths: C F Bb Eb, etc. Play four ascending notes in the first key (G), and start from the lowest available note. Then when you shift to the next key (Eb), move to the next available note in that key, and play four notes in Eb. Carry on through all the keys, going to the highest note on your instrument and then back to the lowest. As you play the notes, say out loud the note-name or the function. E F# G A – Bb C D Eb – E F# G# A# – B C# D E – F G A Bb – etc. If you say the function whilst you play the notes you’d say: 6 7 1 2 – 5 6 7 1 – 4 5 6 7 – 6 7 1 2 – 5 6 7 1 – etc. Can you see that there’s a pattern in the above example? Good to notice stuff like this, I think. As you play this exercise, you’ll find the pattern gets altered at various points. So there you go. 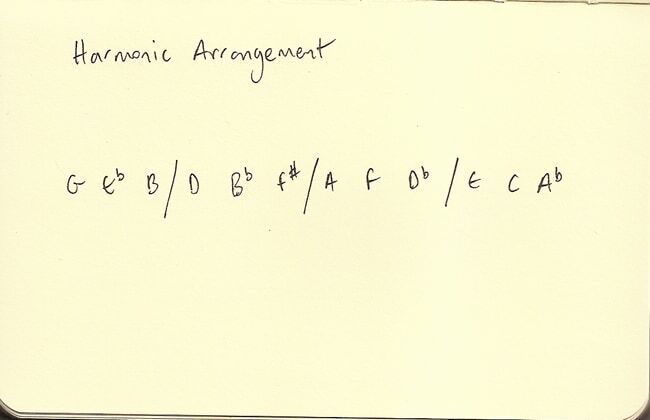 Just by using that harmonic arrangement, you’re working on your understanding of keys. And that’s going to REALLY help you when it comes to being able to keep your ideas developing whilst not being derailed by the chord changes.